August is here and as summer comes to an end, it is back-to-school season yet again. Students are gearing up to return from vacations, summer jobs and internships, and lazy afternoons at home. To prepare, Buzz Marketing Group surveyed over 400 buzzSpotters from all across the country to help you keep a finger on the pulse of 2016 Back-to-School (BTS) shopping trends. The first question is: How much are shoppers spending this year? 59% plan to spend at least $500, while 45% will spend at least $600 and 36% will spend $800 during BTS season. 51% will spend at least $100 on basic school supplies; 61% will spend at least $100 on electronics this year; 70% will spend at least $100 on shoes this year, while 39% will spend at least $200; and 86% will spend at least $100 on clothes. Given this variety of Back-to-School supplies, students are consciously shopping smart this year – specifically, paying attention to value and price point. 72% will keep an eye out for sales when shopping for school supplies, and over half (54%) plan to engage in more comparative shopping online before even entering a store. 83% of BTS shoppers will be using coupons this year, as compared to 73% last year. Although online shopping is increasing in popularity, in-person shopping still wins out during BTS season. While 70% of shoppers will shop online, 74% will go to department stores and 76% will go to retail locations for their BTS purchases. Notably, mobile shopping is also in the ranks. 58% will use smartphones to buy school supplies, while a little over half (52%) will use their laptops and 39% will use tablets. Shoppers will make more than one trip to the store in order to gather all necessary school supplies. Over half (51%) plan to go shopping “a few times (2-5),” while 41% will shop as many times as needed. Only 8% plan to buy all supplies in just one shopping trip. We also asked shoppers about the impact of the economy on their BTS shopping habits. 45% responded that they will use more coupons this year; 29% will purchase more supplies online; 28% will buy more store brand or generic products; and 27% will reuse last year’s school items instead of purchasing all new supplies. Only 17% responded that their shopping habits will not be impacted by the economy this year. 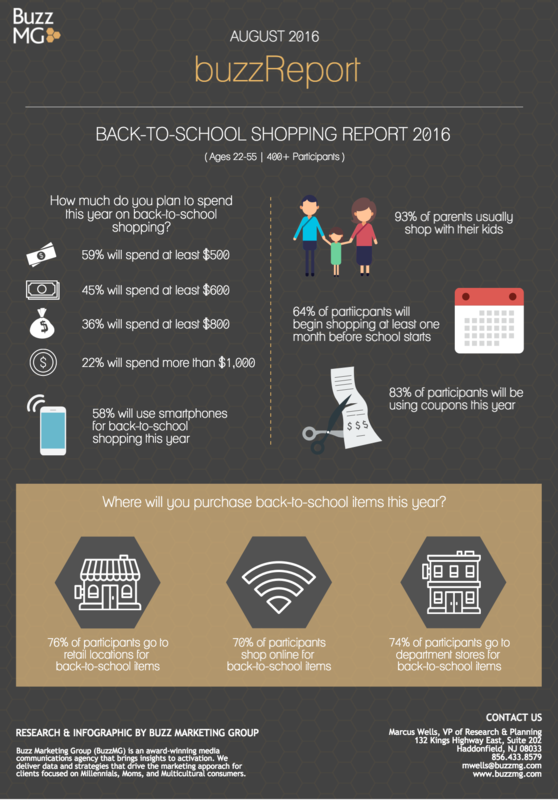 To learn more about our Back-to-School shopping report, check out our August buzzReport and infographic!